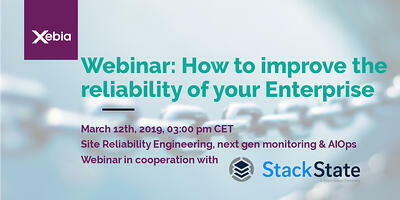 This webinar will focus on the topic of Site Reliability Engineering: DevOps experts from Xebia and StackState will share their vision on how to adress the challenge of keeping your IT operating reliably while transforming your organization and technology landscape. You will learn how reliability is defined and why it is an essential aspect of your IT landscape. We will share experiences and ways to integrate reliability in your application design and architecture. How do you create reliable software applications and how can reliability be monitored. During an interactive Q&A, you can ask all your questions about DevOps, Site Reliability Engineering and monitoring and get an answer from our experts. This webinar is for anyone who wants to improve themselves in the field of DevOps, IT Operations, Development or Application Support. Xebia DevOps is proud to host this webinar in cooperation with StackState, next gen Monitoring and AIOps.